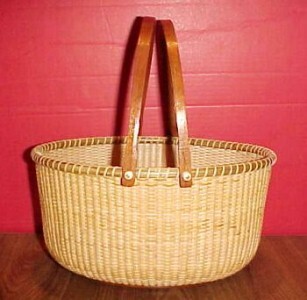 Looking for an even larger oval Nantucket basket? Then this is the Nantucket basket for you! Crafted with a cherry wood oval base, hand-tapered and beveled cane staves, fine Nantucket-grade cane weaving and dyed rattan reed rims with two cherry wood swing handles! The plump shape of this Nantucket basket oval lends itself beautifully to holding knitting, sewing, craft or other basketry supplies, in addition to being a prominent addition to your Nantucket basketry collection! The cherry wood swing handles are beautifully carved and are attached to the basket with either bone knobs and washers (standard), or ivory or ivory scrimshaw knobs for an additional charge! Fine craftsmanship and attention to traditional Nantucket Basketry methods, this Nantucket basket lends itself to so many uses because of its large size. Signed and dated on the base by the basket weaving artist. The Large Oval Nantucket Basket measures 11.25" long x 9" wide and 5.75" high to the rims, 11.5" high to the top of the handles. Signed and dated on the base. Although I am no longer accepting orders for the Nantucket Basket Large Oval, I may craft one or two of these per year. When its ready for sale, you can purchase it directly from my Simply Baskets website.